Mexican restaurants have played a game of hide and seek in the city. Mixed reviews and the difficulty of sourcing authentic ingredients have made them shut shop pretty fast. Then, in comes Chili's American Grill and Bar serving Tex-Mex. Well, not the bar as yet but there's loads on the menu. 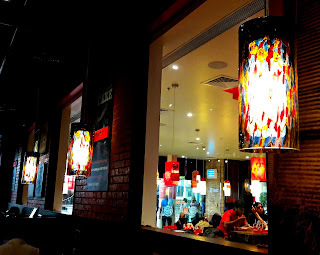 Located at the bustling 3rd floor of Express Avenue, it's got Burger King as a neighbour. I went on the day the outlet was inaugurated and the place was full of VIPs. It's a 120 seater restaurant and the music is peppy. Quite loud too and that makes conversation a tad bit difficult. 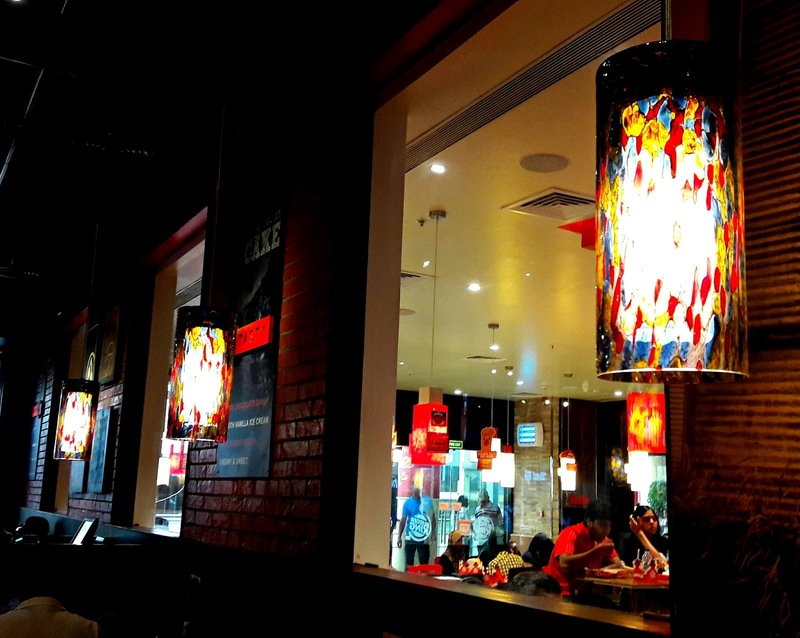 Multicoloured lamps hang along the ceiling, the pop of colour adds to the life of the space. The bar is at the other end, the crew busy mixing drinks for thirsty patrons. A tray is set up beside one of the tables, a sizzling grill plate of fajitas is placed on it and from there, it's transferred to the table. Tableside guacamole is also prepared and served immediately. Neat! Ashish Saxena, CEO Tex-Mex India comes over and we chat. 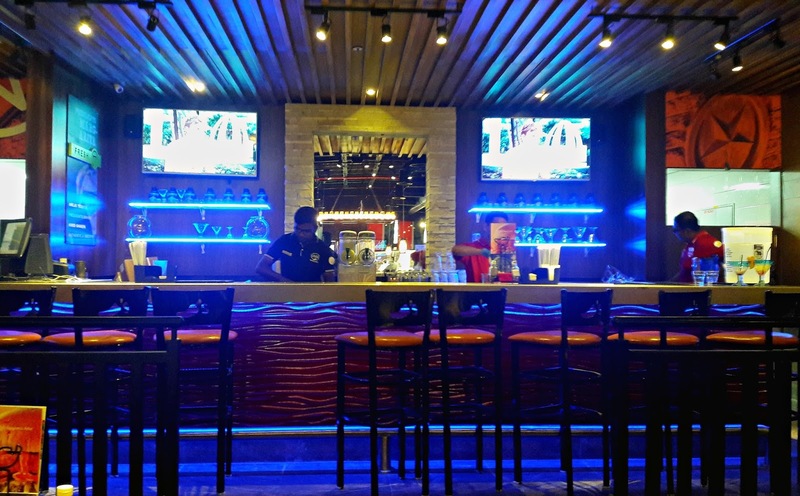 Tex-Mex India runs 3 restaurants each at Mumbai and Pune, 2 at Hyderabad and this one at Chennai. 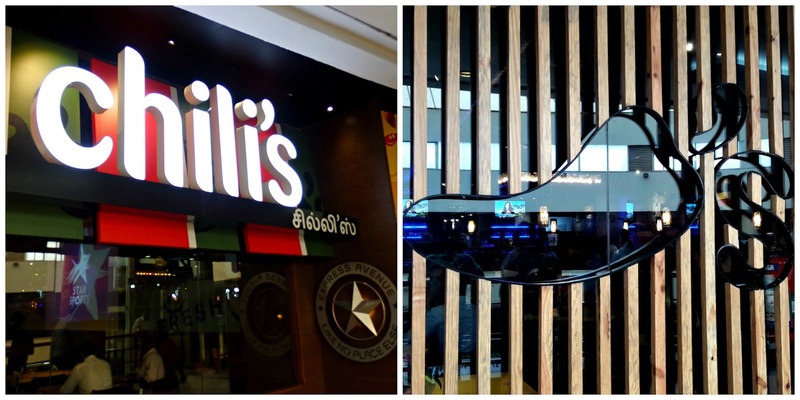 There are other Chili's in other regions but they are run by another franchisee. Of course I was curious as to how authentic they would make the food. A lot of their meats, cheeses and vegetables are sourced in India but the fish is from Vietnam and the Pacific, corn chips from China and the pork ribs from Spain. I guess I got my answer. Watermelon margarita; mango chili margarita. The chillies are garnish! 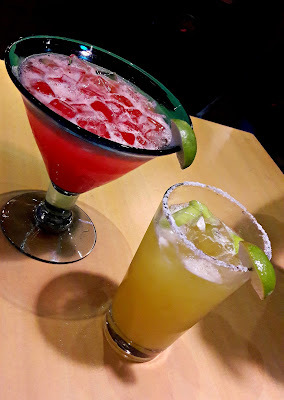 Well, it was a hot day and the folks I was with urged me to try a couple of Chili's signature margaritas. The watermelon chilli was very pink and very pleasant but the flavour of watermelon was somewhat lost. The mango chilli was certainly refreshing but again, the taste of mango was more a hint rather than a statement and as the ice melted, it became a memory. And those chillies in my drink - they were the hottest thing I ate that afternoon! I love appetiser platters - I ordered a non-veg triple dipper. Four types are on the menu and you get to choose 3 of them. The country fried calamari was crisp and crunchy and stayed that way for quite a bit. Original chicken crispers were so tender but I just loved the succulent boneless chicken wings. They come with ranch dip and a honey mustard dip. 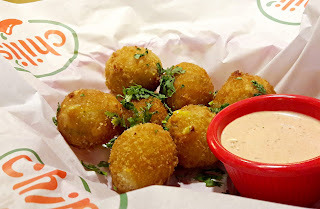 We got a portion of Texas cheese poppers - so deliciously cheesy with their crisp coat of panko. 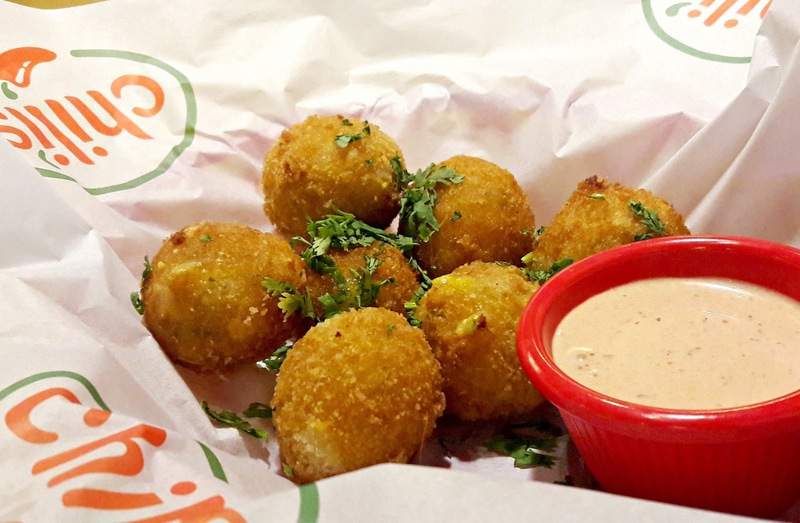 Ditch the cutlery - pick up these babies with your hands and dunk them into the chipotle ranch dip they come with. 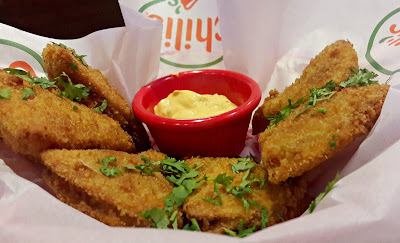 We also had chipotle quesadilla bites - flour triangles stuffed with a mix of cheeses and batter fried. Served with chipotle sour cream, the coating was delicious but the bites bordered on blandness. It could have done with more punch and a more pronounced Tex-Mex flavour. Well, blame it on the cheese! Tex Mex cuisine does use a lot of cheese. 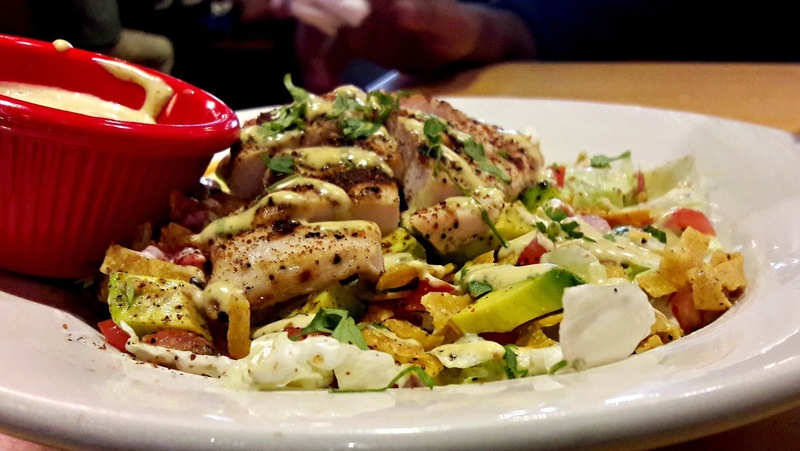 A friend ordered the Sante Fe chicken salad. The chicken strips in them were so tender and there was plenty of tortilla strips, diced avocado, iceberg lettuce and cilanto with cool ranch dressing. While it tasted alright, the lettuce gave it a pale look, I guess a mix of lettuce leaves would have made it more vibrant. It could also have done with a little more of a kick from the pico de gallo. More ranch dressing was served on the side. 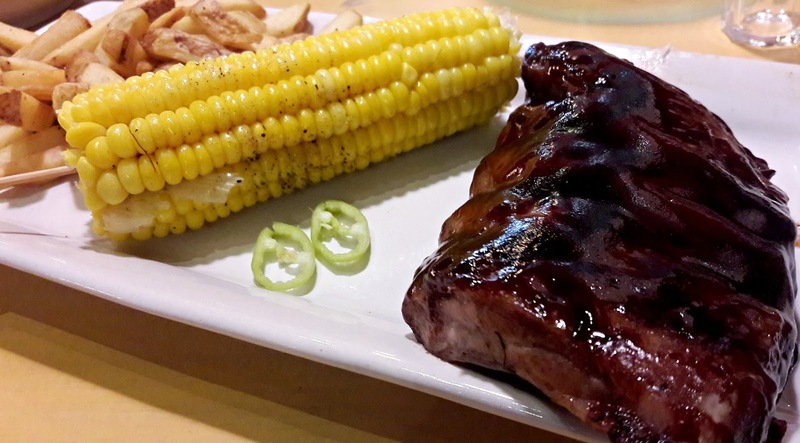 For mains, the baby back ribs came highly recommended. We ordered a half rack of Chili's classic with BBQ sauce. 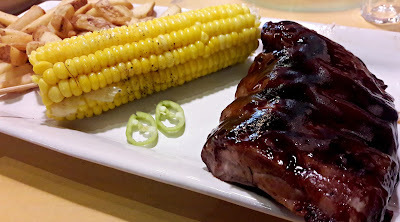 Served with a cob of corn and fries, that was a super tender rack with fall-off-the- bone meat, as the menu promised! And outstandingly moist. About 6 people walking by our table told us to order the chocolate chip paradise pie. The pie was itself was a cross between a cake and a biscuit - dense and studded with chocolate chips and coconut. 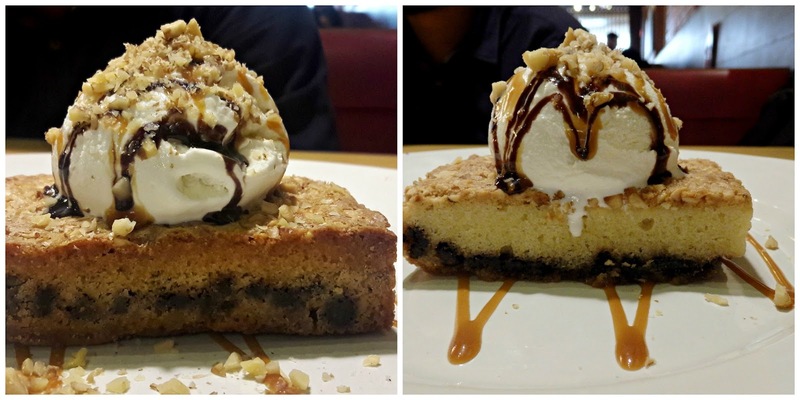 Topped with a scoop of vanilla ice cream, hot fudge sauce, caramel and chopped nuts, it was paradisal! Another was the molten chocolate cake. 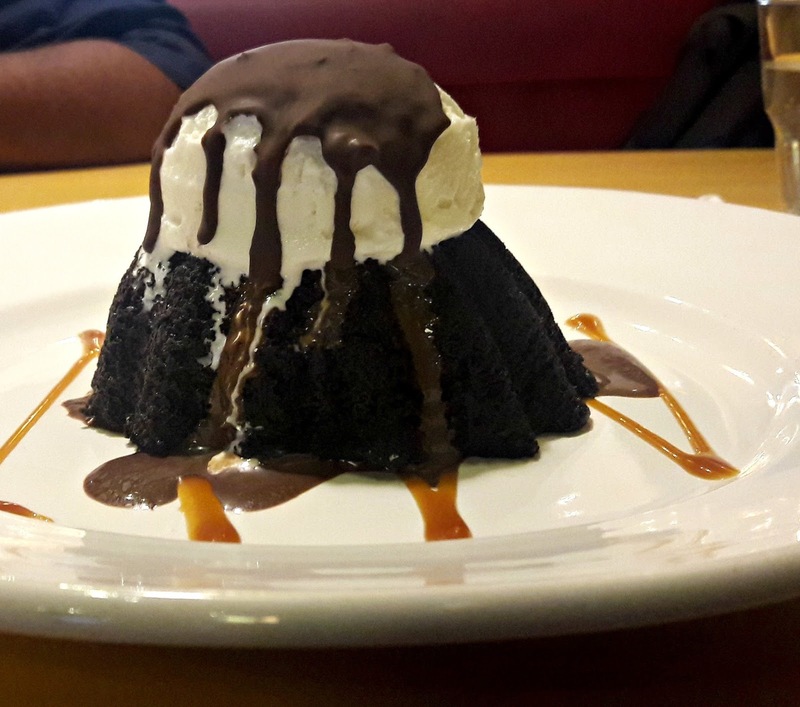 The warm chocolate cake was topped with a scoop of ice cream and topped with chocolate that had hardened into a shell. And inside, a fudge filling that flowed out as we cut into it. Seriously good! 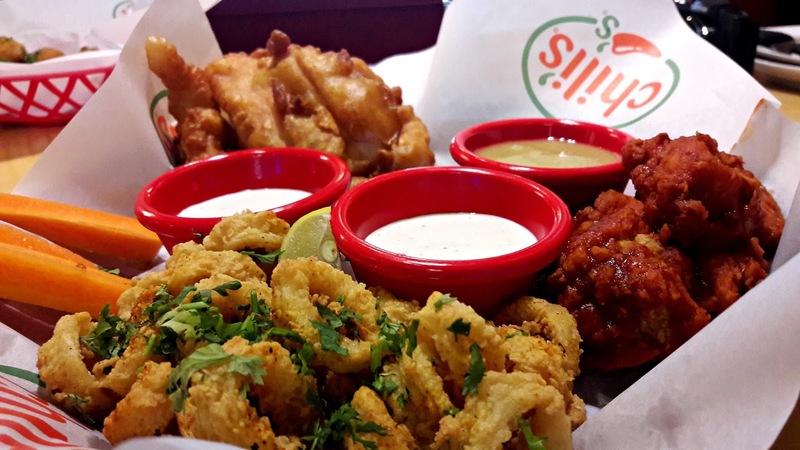 Chili's has so much more on the menu. 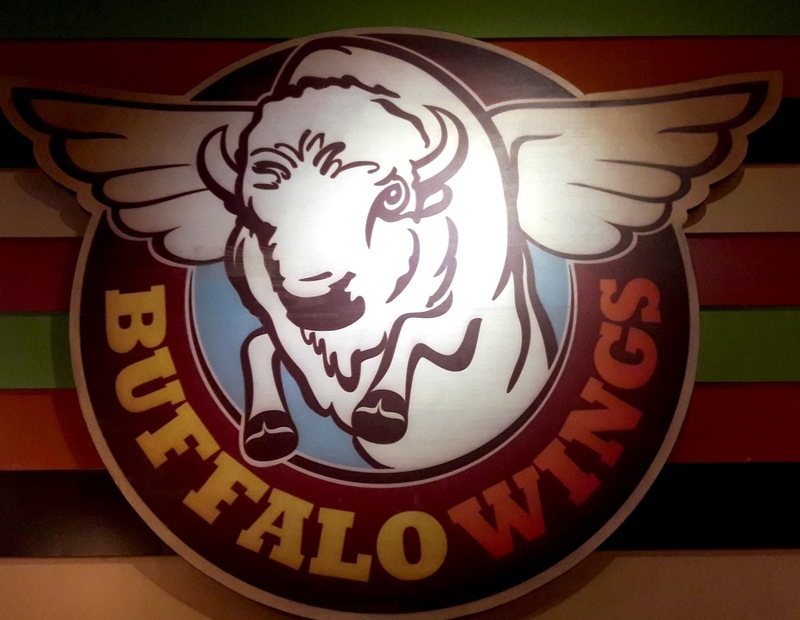 They have a range of crafted burgers, pasta, Mex bowls and of course fajitas, quesadillas, tacos, chilli, ... get it... the whole enchilada! No, no enchiladas though but plenty for the vegetarians too. Pricing is moderate, a meal for two would work out around to 1400/++ and quantities are fairly large. And they have home delivery! But me - I need to go back for the chilli. And those ribs!